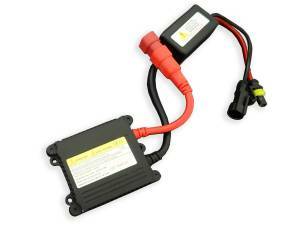 Our 35 watt HID ballast works as a replacement for a ballast from our 35 Watt HID kit or another aftermarket HID kit. It has a 3,000 hour run time. Covered By A 2 Year Guarantee! Our HID headlight kits are extremely reliable, and fully backed for 2 years! Our 35 Watt HID ballast is designed tough with dust, water, and shock protection. Dimensions: Length: 2-3/8" x Width: 3-5/8" + Wiring x 5/8"